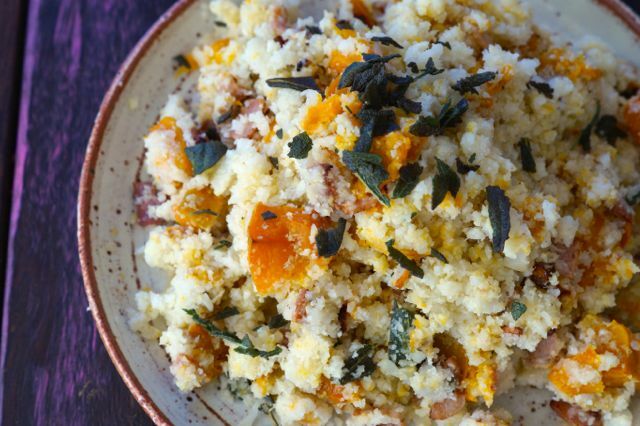 Pumpkin and Bacon Cauli-rice with Sage. We mentioned our obsession with pumpkin earlier this week, it’s 100% our favourite vegetable at the moment! It’s all kinds of amazing and makes every breakfast, lunch or dinner a billion times better. 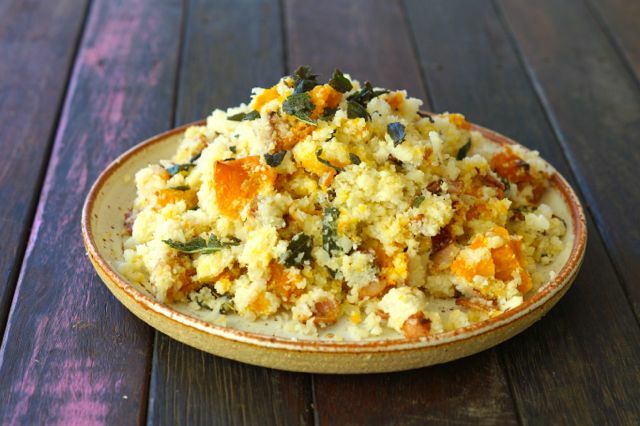 When you eat pumpkin prepare for a heap of health benefits… and it’s extremely versatile! What’s not to love?! Perfect for savoury and sweet natural real food recipes. 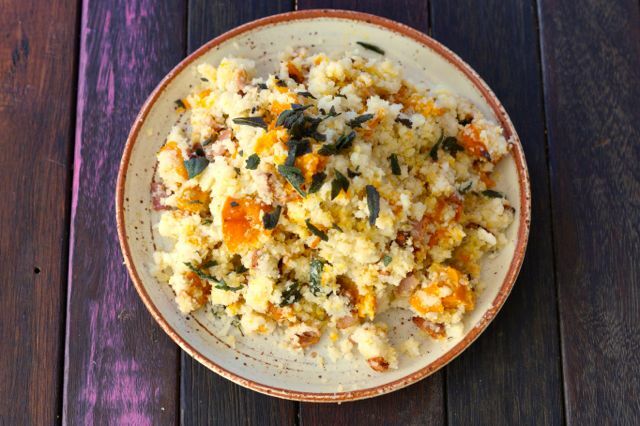 This pumpkin and bacon cauli-rice with sage recipe is full on delicious! We highly recommend you give it a go! We get our organic pumpkin from our local SupaBarn, their organic fresh produce section is growing and growing which makes us SO excited! They also have the best herb section, picked and delivered fresh every morning (YES, we said picked. Every. Morning!). Place the chopped pumpkin in a single layer on 1 of the baking trays and place in to the oven for 50 minutes. Meanwhile, cut the cauliflower in to florets and grate or food process to make it look like 'rice'. Place the cauli-rice in a single layer on the other baking tray and place in to the oven for 30 minutes. In a medium heat fry pan add the bacon and cook until crispy. Transfer the bacon on to a plate and keep the bacon fat in the pan. Turn the stove up to high heat, cook the sage leaves in the bacon fat until crisp. When everything is cooked, carefully combine the cauli-rice, pumpkin, bacon and stir through the olive oil, lemon and salt and pepper. Top with crushed sage leaves. This recipe rocks! Serisiouly. Our new favourite healthy side dish!